Near the end of my pregnancy, my feet were so swollen that I couldn’t wear shoes, I was so uncomfortable that I couldn’t sleep and even just the thought of getting dressed up for a night out was exhausting. Sound familiar, ladies? If you feel the same way, you’ll want to give your husband the following list of at-home date ideas to plan for you. There are some great ways to get pampered on a special date night without having to leave the comforts of home. Don’t miss the free printables to help you get the date nights ready to go! So now I’ll talk directly to the man in your life to give him some handy pointers. 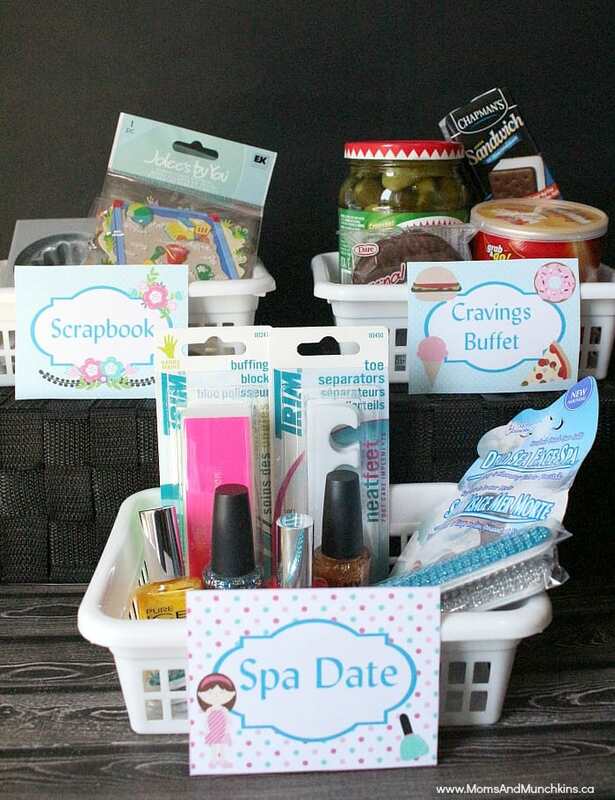 Spa Night: There are so many easy ways to plan a spa night at home and your wife will love the special pampering. These at-home date ideas include a warm foot bath with bath salts; an exfoliating foot massage; a lotion foot and leg massage for those aching feet; painting her toenails (just because she can’t see them doesn’t mean they shouldn’t be pretty! ); a cool relaxing face mask. Cravings Buffet: Has your wife had any wild cravings like pickles and ice cream? One of my biggest pregnancy cravings was burritos! Find out what foods your wife is craving and plan a special cravings buffet. You can serve these to her on a breakfast in bed tray while lounging on the couch and watching a good movie. You can even add a few extra touches of romance with flowers and candles. 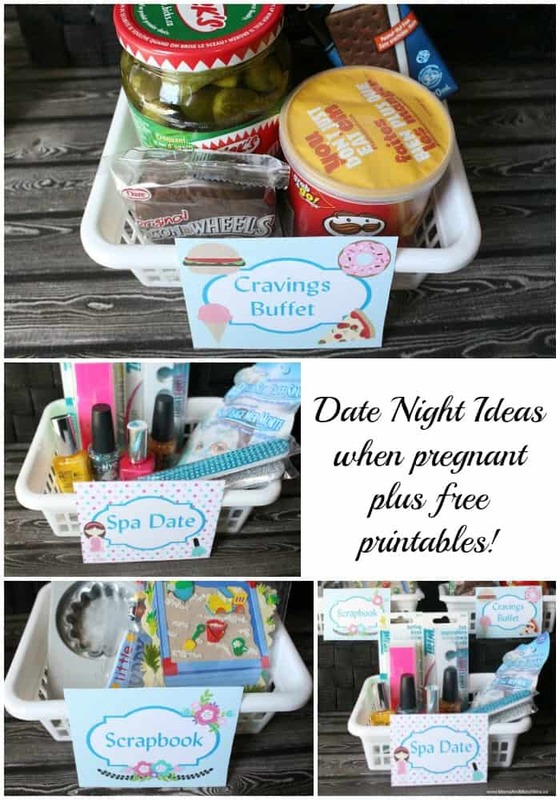 Scrapbook: I know most men aren’t into scrapbooking but if you’ve been taking photos during the pregnancy then you can use these for a creative date night. Simply visit your local craft store and pick up some scrapbook supplies. Not sure where to start? That’s okay! The sales associates are there to help. You can then plan a special date night around documenting some of your special pregnancy memories. Want an adorable added touch? Secretly ask her parents for some of her baby photos and gather some of yours. This is a great addition to the scrapbook and it’s cute to see the baby resemblances once your little one arrives. What are your favorite at-home date ideas? When you were pregnant, did your husband plan any special at-home date ideas that you want to tell us about? For even more fun date ideas plus FREE printables, visit our special Date Ideas page. Moms & Munchkins is also filled with fun baby shower ideas and activities for all ages. Never miss an update by following us on Facebook, Twitter, and Pinterest with sneak peeks on Instagram. A special thank you to Wendy’s Printable Party for designing the printables for us & Erin Bradley Designs for the cute clipart. That is cute! I like the idea of the cravings buffet for the mommy to be. 🙂 And the spa night sounds fun, too! The Cravings Buffet is cute! My husband and scrapbooked when I was pregnant, it really brought us closer together and now my kids love looking back on them knowing that daddy helped.